Apple’s iconic figure and CEO maybe on medial leave, but that hasn’t hindered the success of Apple’s Fourtune 500 companies. Yes, their multiple Fortune 500 companies, from iPad to App Store that would be ranked in the top 1/3 if the product were just a company within itself. The success of Apple’s iPad has increased over the last 6 months. In the recent New York Times Article, Lohr writes about the extreme growth of Apple’s latest mobile device, the iPad. What fascinates me the most, the iPad is less than 1 years old from it’s release date from April 2010! A little more than a decade a go, Apple was once “60 days from bankrupt”, but has turned the corner to great amazing products. The iPad was just warming up in 2010. The iPad is estimated to bring in $15 – 20 billion in revenue from it’s first year on market. The amazing platform Apple has created not only makes you want to buy an iPad, but an iPhone, and maybe an iPod touch for someone else. Let’s look at the revenue for Apple $499 (16GB iPad) + $199 (16GB iPhone 4) + $229 (8GB iPod touch) = $927 – close to $1,000 per customer not bad! And that doesn’t include the people who may purchase a iMac to be a companion with their new iPad, so we can add at least $1,200 to the $1,000 revenue for Apple. The $2,200 profit was just based on hardware, did you forget about the App Store? Though most popular priced apps are only $.99 to $1.99, the price can add up. It is estimated to be an approximate $50 per consumer for the iOS App Store and remember Apple gets 30% of the price. Now their is the Mac App Store and prices are increasingly higher. From $29.99 (Pixelmator – our review) to $79.99 (Aperture) – Aperture is made from Apple so that’s 100% profit in that instance. The App Store in itself is an estimate in 2011 to bring in $15 bilion dollars. That’s another Fortune 500 company within itself. What do you think? Leave a comment. iTunes to go to the cloud with Safari? First of all, let’s talk about Safari. What is Safari? Safari is a web browser. It is designed to remove the majority of distractions by having a browser frame that is a single pixel wide. The scroll bar appears only when needed. Safari works on iPad, iPhone, iPod touch, Mac, and PC. Safari Reader removes distractions such as ads and helps you focus on the online articles you want to read. Safari also has Private Browsing, which makes it so Safari does not remember information such as your history and cookies. Now let’s talk about iTunes. What is iTunes? iTunes is a free application that runs on Mac and PC. It organized your music and movies into a library. iTunes can play your music, movies, videos, and TV shows on your Mac or PC. iTunes also has the iTunes Stores, a marketplace that sells music, videos, movies, and TV shows for you to download for a cheap price. iTunes also makes it easy to sync your music and videos onto your iPod, iPad, and iPhone. iTunes can also wirelessly sync your iTunes library to your Apple TV. There have been rumors that iTunes is going to the Cloud with Safari. Apple may be preparing to merge Safari and iTunes. In December 2009, Apple bought the company Lala for $80 million. Using the technology from Lala, Apple will be able to incorporate iTunes into Safari and permanently make iTunes a web-only application that is exclusive to Safari. If this happens, Safari will most likely become a more popular web browser. If iTunes goes to the cloud, there will be advantages and disadvantages. The advantage of iTunes going to the cloud is that you will be able to access your whole entire library from anywhere where you have access to the internet. The disadvantage of iTunes going to the cloud is that you won’t have access to your library from your computer alone. All the music, videos, movies, and other stuff that you purchased from the iTunes store would not be stored onto your computer if iTunes goes to the cloud. If iTunes were to shut down, all the money you put into buying the music and videos would go to waste. What do you think? Is this a good idea or a bad idea? 16% of AT&T users willing to jump to Verizon. Good or Bad idea? Finally, all the talk about Verizon getting the iPhone4 has come. The date is not set but it is true that it is coming to Verizon. Reports have said that it is coming out this month. Verizon will be thankful that the iPhone4 is finally coming to them. This means that Verizon will get many new customers because so many AT&T customers have complained about the call quality and such. Reports say that 16% of AT&T customers wouldn’t mind switching over to Verizon. The main reason is that Verizon has better 3G coverage, less dropped calls, and price. AT&T makes new customers pay for a certain amount of data. Instead of giving unlimited data, you have to pay a certain amount for a certain amount of data. Verizon still gives unlimited data but maybe AT&T will change that just to get customers back. Verizon has better 3G coverage even though AT&T has faster 3G. Also Verizon has less dropped calls, 2%, compare to AT&T’s 6% of dropped calls. AT&T is slowly improving on their dropped calls rate but it isn’t even close to Verizon’s. AT&T users have continually complained about the poor reception and dropped calls. Is it really AT&T’s fault because many reports have also said that the iPhone itself has poor signal and quality? Maybe you should think first about switching over. I am currently with AT&T and I can’t say anything bad about it. I haven’t had that many dropped calls compared to many other people out there. There is a reason to why certain people get dropped calls more than others. It depends on where you are including the amount of people your around. Certainly when you’re in a large business meeting and everybody is on their phone, you will get a dropped call. Verizon has said that their network has enough power to hold all the new iPhone users. If more users switch over to Verizon, maybe AT&T will have less dropped calls because less people will be using less 3G. Look for Verizon to have more dropped calls. Anything can happen this late in the game and the challenge has definitely been thrown down. I personally do not think that it’s worth it to switch over to Verizon. It’s too much of a hassle and AT&T has proven itself to fix the problems that customers complain about. I say wait until more reports come out about Verizon’s iPhone and then make your decision. 10 billion App Downloads Countdown, here we go! 10 billion apps, WOW. That is one of the words that can describe this feat that Apple accomplished and it will be here shortly. 10 billion apps is such an amazing feat that Apple is going to give $10,000.00 in iTunes gift card to the 10 billionth app downloader. All you need to do is have any iPod that is able to download apps, find an app for you, download it and hope that you are the 10 billionth winner. It is all luck but hey, I wouldn’t mind having an extra $10,000.00 at my disposable. The accomplishments that Apple has created are incredible. From the first app ever downloaded until now, Apple has dominated this industry. Apps are commonly found on many devices now, but Apple is certainly the one that has created this booming industry. 10 billion apps downloaded are just unthinkable now. We all think that it must have been ages ago that the 1 billion app was ever downloaded. That happened on April 23, 2009, only two years ago. That really isn’t to long compare too many other accomplishments. With many new apps that come out every day, it isn’t a huge surprise that more apps are being downloaded faster then ever. Since the billionth app was downloaded, apps are being downloaded so much faster now. It only took six more months for the 2 billionth app to be downloaded. That is four times as faster than it took for the 1 billionth to be downloaded. Many more people are buying iPods which means that many more consumers will be downloading apps. This also means that there have to be a lot of great minds out there. It takes a lot of work to create an app and a lot more of luck for the app to be successful. With the strict rules and regulations that Apple has on app designers, I’m surprised there are so many designers. I am extremely glad that there are though, I love playing a new app every day. From the textfree designers to the cut the rope designers, there is an app for everybody. My favorite app is The Weather Channel app. It gives me instant access to hourly weather reports, 10 day weather, and I love the severe weather. It lets me know what to be careful of especially storms. If this is my favorite app, what’s your favorite app? The Verizon iPhone. We’ve all heard rumors of it. We’ve all fantasized about having it. And now it’s finally here. The rumors of the Verizon iPhone have been in circulation for as long as I can remember, but now all of the dreams of Verizon customers stuck with Android phones have come true. Sure, it’s great that it runs on Verizon, but how is it different than the AT&T version? Well, there’s a few added features that might make Verizon customer’s mouth’s water. First off, the antenna of the Verizon iPhone is in a different configuration than the AT&T version. Apple claims that this was just because CDMA phones need different antenna configurations, but it also conveniently solves the problem created by “The Grip of Death“. The new antenna design results in the volume and mute buttons being moved slightly up, making iPhone cases for the AT&T version incompatible with the Verizon iPhone. The phone, which runs iOS 4.2.5, also comes with a “personal hotspot” feature, which allows your phone to become a mobile hotspot for up to 5 devices at a time. This feature has been available to iPhone users who jailbroke their iPhone and downloaded MyWi, but now is available without the large price (19.99 through Cydia) or the risks of jailbreaking your device. This feature may not become available to AT&T customers, as the company has made statements in the past saying they will not allow Wi-Fi tethering. The Verizon iPhone will not run on Verizon’s newly unveiled 4G LTE network for now, so we will have to wait for the iPhone 5 for an iPhone that runs on a 4G network. 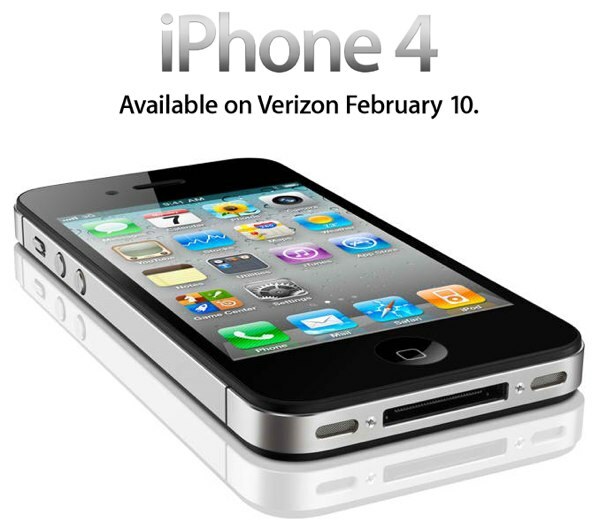 The Verizon iPhone can be pre-ordered by current Verizon companies February 3rd, and becomes available February 10th. It will cost $200 for the 16GB model on a 2 year contract, and $300 for the 32GB.